Hi. I've own an iPad Pro 2015 model, using mostly for ForScore. Considering using it now for live synth playing. What hardware do you recommend? I have a Nord A1 synth which likely has USB. Apart from the headphone jack how do I get the audio out of the iPad synths into my PA speakers? Thanks for this. Any sample setups like this would be welcome. The simplest solution would be plugging a set of Bluetooth LE MIDI dongles into your Nord A1 (Quicco mi.1 or Yamaha MD-BT01) and use an adapter cable from the headphones out to the PA D.I. box. Bluetooth MIDI latency is negligible and the sound quality of the iPad's phones out is good enough and has low enough output impedance too. I would only add more hardware if this kind of setup doesn't work for you. Big fan of the Yamaha adapters, the UD and MD, they work absolutely flawlessly. 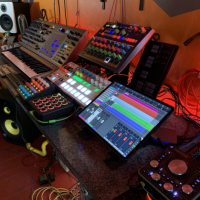 If you do get an interface, I recommend an Arturia Audiofuse, plug and play with iOS, the i/o channels show up instantly, plus it has 3 powered USB ports that you can plug even more crap into, which I love. Also very low latency, low enough to use effects on multiple external instruments through iOS and hear in real time, I think it’s usually around 6ms round trip. Many more features but ya, amazing piece of hardware.